You are currently browsing the category archive for the ‘in the backyard’ category. Radishes, butter, sea salt, fresh bread. Eat together and you’ve got a classic French breakfast food and/or cocktail-hour snack. Remind me why I hadn’t tried this before? Maybe because we didn’t eat radishes that way growing up. And when you don’t, the combination sounds weird no matter how many good things you read. It happens I’ve read plenty — Sally for one promoted their merits a couple years back, and she gives sound advice. Molly Wizenberg got nostalgic over them in her lovely book A Homemade Life. I remained dubious, however. Well. Turns out it’s good. And so simple. Radishes and salt bring out the sweetness in butter. Creamy butter tames the radishes so they’re interesting instead of hot and bitter. You want to slice the radishes so thin the slices are practically transparent — like “a communion wafer”, Wizenberg suggests. Or mince them fine, toss with sea salt, and sprinkle over your toasted, buttered bread. 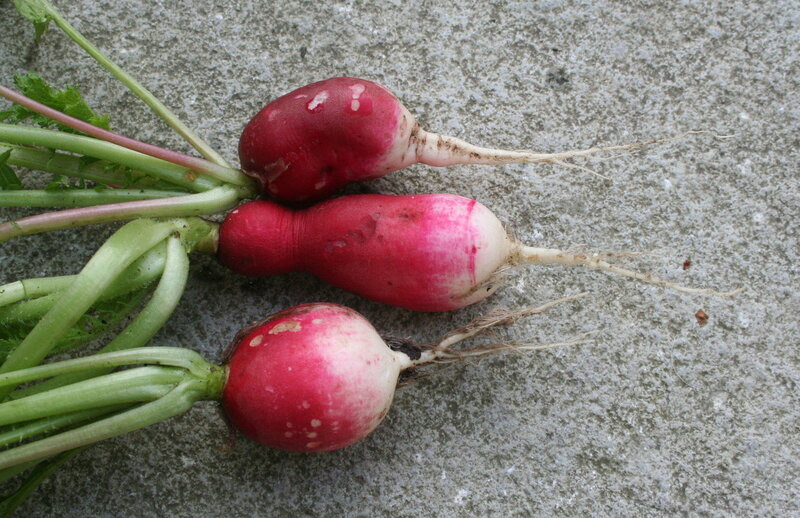 Try it if you’re stumped by that bunch of radishes in your weekly CSA box. Or even if you’re not. I promise you’ll like it. Especially when you’ve just poured your first glass of pinot and you’re pawing about for sustenance and inspiration with which to cook the evening’s meal. It’s July 1 and snow peas are finally in. What is this, Alaska or something? In any case we’ve got scads of them this week, too many to munch raw while puttering in the garden. So we’re quick cooking whole pods in a hot skillet and sprinkling with an amalgam of crushed sichuan pepper, salt, and black pepper. It’s fast and easy and the peas stay crisp, sweet, and beautiful. 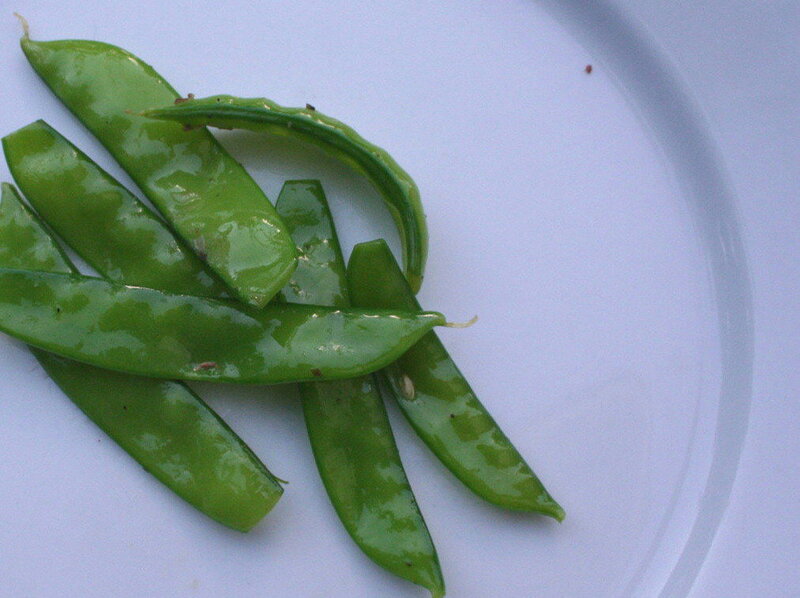 What’s your favorite way with snow peas? Here I was thinking the growing season was shaping up so nicely. Cover crop cut down in early March, biomass and fish fertilizer turned into the soil with plenty of time to break down. No foot-dragging this year about the overwintered kale, which I chopped and composted early. Seeds went in apace, and nothing to expect but forward progress from there. Indeed, the spinach and chard are now up and growing. But a glance around the patch and the depressing fact is that everybody else’s plots are already flush with lettuces, beets, and peas. Meantime you can barely see the green stuff in ours. Who doesn’t want to keep up with the Joneses? And yet we only seem to fall further behind. 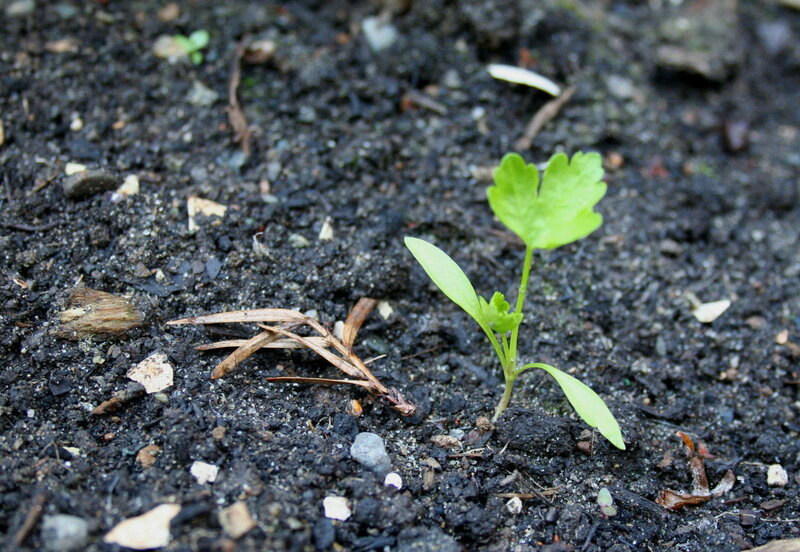 Yesterday on a fly-by with the Biscuit, I transplanted three parsley seedlings and that was pushing it. My home tomato starts are barely on their second set of leaves, and the pumpkin sprouts that I left out overnight last week turned white and stunted. So no more relying on just the goodness of Nature. I’ve wrapped simple plastic tents around the pumpkins and lettuces and basil, little personal greenhouses that trap the sun’s warmth for chilly nights, and the plants seem to be perking up. We’re going to abandon home grown for bigger, healthier tomato starts from the farmer’s market. And I’ll dig some of my worm bin compost into the soil around heavy feeders like zucchini a couple of weeks hence, a habit that reaped dividends in prior years. What’s your favorite trick for speeding up the season? 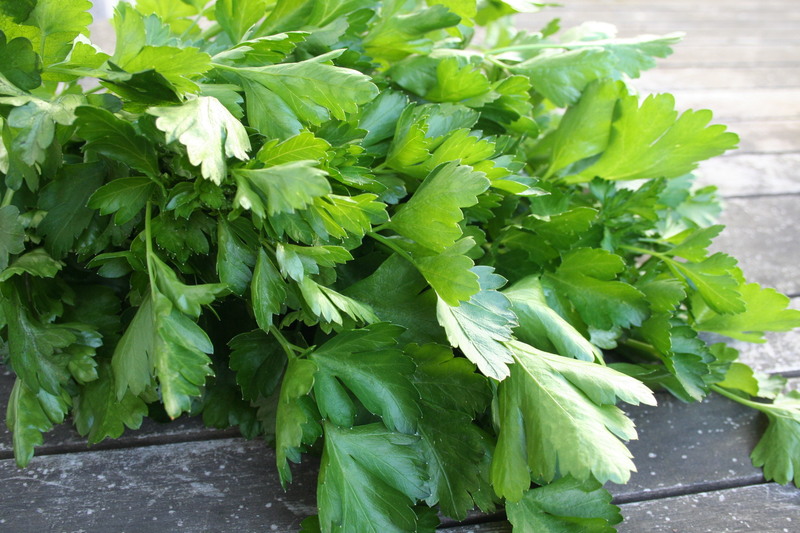 A humble garnish most of the year, parsley elbows its way into the kitchen every spring when the garden’s overwintered plants bolt and the sheer mass of green simply must be dealt with. Sure, you can make tabbouleh. Deborah Madison describes her recipe as “moist and intensely green, practically a parsley salad”, and it’s earthy and hearty, a lovely way to use that first flush of spring mint besides. I casted about for ideas. A friend suggested chimichurri, which I dutifully concocted for grilled steaks. Tasty. Still, there was plenty more parsley. Much more. I consulted my cookbooks; English chef Simon Hopkinson suggests a potato-based parsley soup, which sounded too frankly plain, as well as a parsley salad tossed with anchovies, olives, and capers. I wasn’t sure about that either, but after noting a similar Alice Waters recipe, I allowed that there might be something I didn’t know about here. Indeed. We adored this bright, briny, green pasta, which matches wonderfully with fresh tuna. And it’s so easy to make that I’m glad — dare I say — this year’s parsley seedlings have broken ground. Slice tuna thinly. Zest the lemon, then slice off the ends, cut away the white pith, and slice the remaining flesh into rounds. Begin cooking the pasta. Heat a large skillet over high heat. Swirl 1 tbls of the oil in the pan, then saute tuna until no longer raw, 2 to 3 minutes. Reduce heat to medium. Add garlic, capers, olives, and lemon zest and rounds and cook, stirring, for another minute or so. When pasta is ready, drain and toss tuna with pasta, parsley, and remaining olive oil. Taste and add salt and pepper to taste. Sprinkle with Parmesan cheese, if desired. Feeds 2. 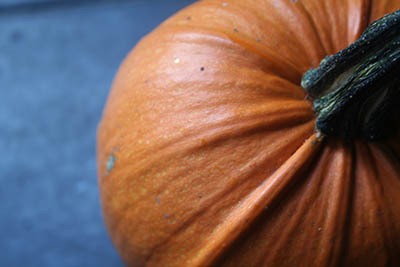 Adapted from Alice Waters and Simon Hopkinson. 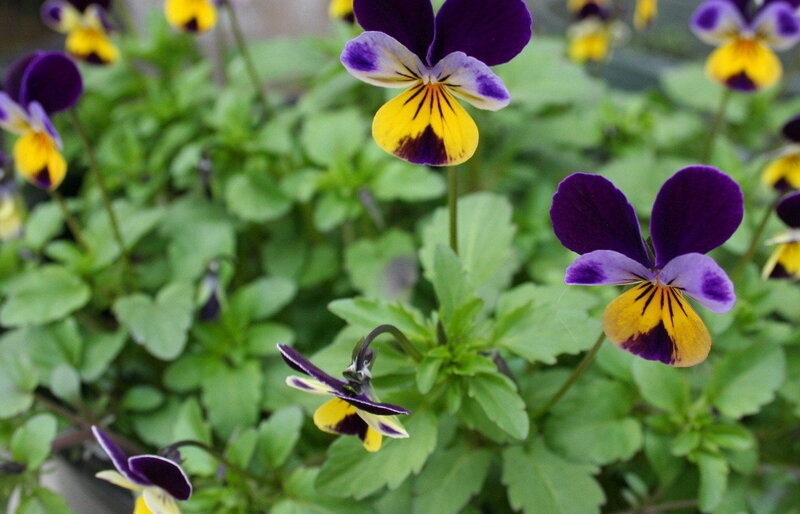 Violas. I planted them for three summers, but I don’t have to anymore because they come back as sure as snowbirds. I think they’re cheerful, and the flowers are edible to boot. Some people call them invasive. Me, I say they’re sustainable. I’m grateful for edible perennials right about now. Not that I don’t love the spring ritual of planting seeds, of watching seedlings break soil. But there’s also something wonderful about peaceably co-existing with thriving plants. Like our thick clump of sorrel. Like the raspberries and blackberries in a weedy side yard. And all of the herbs, hardy and tender. 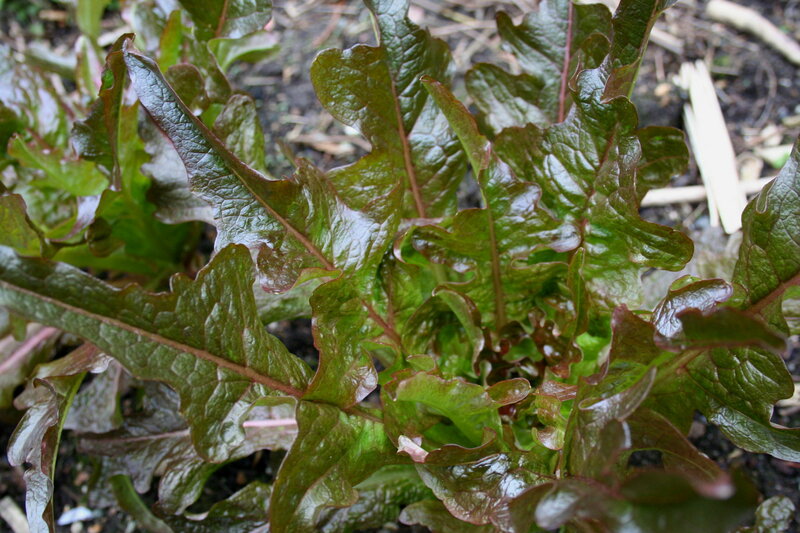 There’s garlic and horseradish that I aspire to grow too, and rhubarb, a plant that my fellow blogger Stephen considers a weed, it’s so ubiquitous in Alaska. 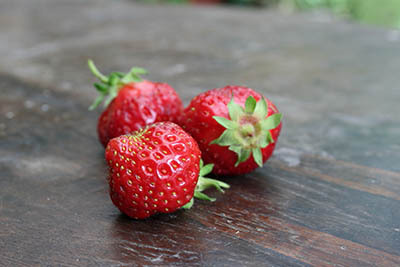 What are your favorite edible perennials? The Biscuit and I made it over to the pea patch last week where, thanks to irrepressibly warm weather, the plots are flush with cover crop, and with weeds. She entertained herself with a sprig of mint while I pulled shotweed and chopped some of the vetch and peas. Then she ramped up to a full-throated fuss, I plucked a few kale stems, and we were on the move again. It’s the same guerilla-style gardening in the back yard. During naps I run outside to work leaf mold and fresh compost into the ground. There’s been just enough time to plant spinach, arugula, and greens. And how fantastic is it not to be preggers? A gardener can get up and get down and get all around and not be panting for air. And now that Biscuit’s sampling her first solids, including last fall’s butternut squash, the growing season holds that much more promise. 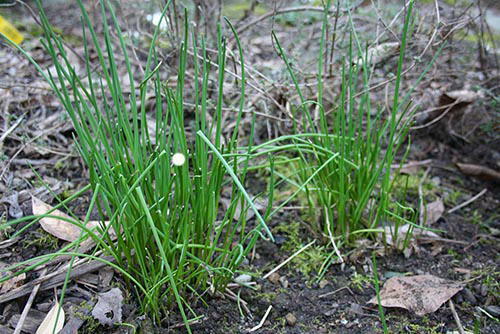 Thanks to a warm January — the warmest on record, they said on the radio — the chives have woken up and put on serious growth. Tarragon has broken ground, too. There’s something comforting about watching the garden start up its old familiar song again, something so great about watching brand new life push up from the earth. And it sure makes all those bare wet branches and dead leaves strewn about seem less a blight. What are the first signs of life in your garden? Last week our southerly neighbor cut down their sprawling blue spruce tree. 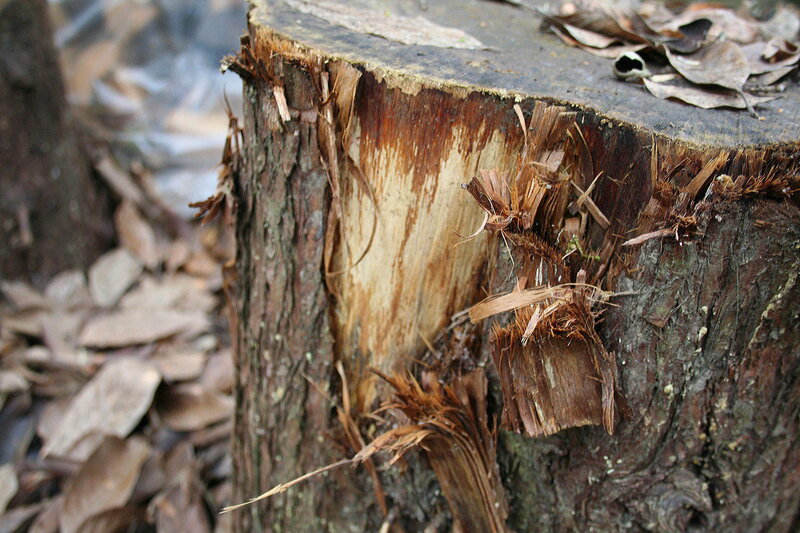 It’s always sad to watch a big tree go down, and this one was an institution, its stump fifty rings across. The upshot is there’s lots more sunshine coming into our backyard now. In all the time we’ve lived here the only things that thrived in the shade of that old spruce were greens like chard and lettuces. So when I saw the piles of sawn logs across the way, my thoughts went immediately to the seed catalogs, and all the new things we might grow this year. A tree dies, and new life rises in its place. A happy thought for the new year.